Kementerian Keuangan Republik Indonesia - Kemenkeu or the Ministry of Finance of the Republic of Indonesia and is a government ministry in Indonesia that hold responsibility on finance and state assets. The Ministry Finance was previously known as the Department of Finance Republic of Indonesia (Indonesian : Departemen Keuangan - Depkeu). The Ministry of Finance is domiciled in Jakarta and headquartered in Jl Dr Wahidin No 1 Jakarta. 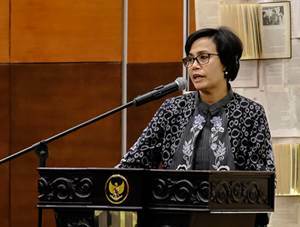 The Ministry of Finance was lead by the Minister of Finance (Menkeu) and in the Indonesian Working Cabinet (Kabinet Kerja) held by Sri Mulyani Indrawati, replacing Bambang Brodjonegoro. According to information found in the Ministry's website as cited by JobsCDC.com, The Minister of Finance is assisted by 8 directorate generals, namely Directorate General of Tax, Directorate General of Budget, Directorate General of Customs and Excise, Directorate General of Financial Balance, Directorate General of Treasury, Directorate General of Debt Management, and Directorate General of State Assets Management. JobsCDC.com now available on android device. Download now on Google Play here. Please be aware of recruitment fraud. The entire stage of this selection process is free of charge. Kementerian Keuangan - 597 Formations CPNS D3, S1, S2 Kemenkeu September 2018 will never ask for fees or upfront payments for any purposes during the recruitment process such as transportation and accommodation.